Recently, my good friend and long-time colleague Dr Peter Barlow passed away. Peter was one of the true ‘greats’ of botany and his contributions to many different aspects of plant biology are numerous, important, and often seminal. It must be left to others to assess his true contribution to botany in particular and biology more generally, but I’d like to share some reflections on Peter as a man as well as a scientist. 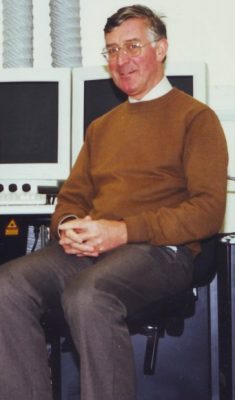 Although my collaboration and working association with Peter lasted for only seven years at Long Ashton Research Station (near Bristol, UK) in the 1990s, we continued to keep in touch after I’d left Long Ashton in 2001. What are my memories of Peter? First, and absolutely foremost, Peter was a life-saver. That is not too strong a term. After all, it was he – jointly with Prof. John Barnett of Reading University (UK) – who were awarded the BBSRC grant that rescued me from the world of accountancy in 1994 and got me back into plant biology – my first love. That appointment was quite an act of faith on both their parts. To take on somebody who’d been away from research in the wilderness of double entry and auditing since his previous post-doctoral position at Durham University (north-east England) had ended in 1985 was more than a leap in the dark (for all parties). Furthermore, in my previous research role I was looking at ultrastructural details of plasmatubules (Chaffey & Harris, 1985), and grass ligules (Chaffey, 1985) – both topics rather far removed from indirect immunofluorescence imaging of the cytoskeleton in cambium and developing wood cells in horse-chestnut roots(!). Fortunately, they clearly saw something in what I had to offer. And for that I can never thank Peter – or John – enough! That 3-year collaboration was successful enough for me to be a named investigator for Peter’s contribution to a much larger pan-European EU Framework project – co-ordinated by John Barnett – in which we investigated the cytoskeleton in developing xylem of tree roots for a second 3-year period from 1998, this time in hybrid aspen. Peter treated me as an equal. Although Peter was my boss during my post-doctoral years with him, there was never any of the “I’m in charge, you’re the employee, this is what you will do” attitude. Rather, Peter had a much more enlightened, hands-off management style which was extremely refreshing, and gave me a lot of freedom to develop the work in the way I wanted to, just to see where it led. Probably the most memorable of the several serendipity moments that approach encouraged was when we obtained some anti-myosin antibody from Peter’s long-time colleague and co-worker Frantisek Baluska in Bonn. Myosin is a protein that’s associated with the cytoskeleton family of cell components we were studying in tree roots. We knew myosin was found in various animal cells and tissues, but what about plants? It seemed like a good idea to see if we could find it in our material. We did, and that led to the discovery of “plant-like muscles” in trees (Chaffey & Barlow 2002). Who’d’ve thought that would be the result? Not me at least. But, this sort of discovery was only possible because of the nurturing and highly supportive working environment that Peter created. It was also an extremely successful partnership. Often in collaboration with John Barnett, Peter and I produced 16 papers from those tree biology years (e.g. Chaffey & Barlow, 2001, 2002; Chaffey et al., 1999, 2000, 2002). Happy days! Peter was incredibly productive – and kept up a seemingly furious rate of publication right up to the last few weeks (e.g. Gallep et al., 2017). I have no idea how many papers he wrote or co-wrote, but I do know it was a lot. A catalogue of Peter’s outputs would be most illuminating and would reveal contributions to such areas as: mathematical modelling of plant development (Barlow & Zieschang, 1994); the cell body concept of plant organisation (Baluška et al., 2004) root biology (Baluška et al., 1995); de Bary’s aphorism (Barlow, 1982); the contentious subject of plant intelligence (Barlow, 2008, 2010); the development of structures on the trunks of ginkgo (Barlow & Kurczyńska, 2007); the role of the cytoskeleton in wood cell development in trees (Chaffey & Barlow, 2001); and the effects of cyclical lunar phenomena on plant biology (Barlow, 2015). But, Peter published beyond plant biology as well. One of the most intriguing of those contributions I’ve unearthed to date is his paper musing upon the reason why there are so many sperm cells (Barlow, 2016). One can only wonder what else Peter’s intellect and ever-enquiring mind would have led him to produce if time had permitted. Peter was a stickler for details – especially when it came to his writing. I say that as somebody who has co-written – and re-written! – many articles with him(!). Well I remember the scrupulous way he would pour over the proofs that the publisher had produced from his manuscripts, and the numerous corrections he would subsequently propose. Usually, one would expect those items to be put right by the publisher before the article was finalised and published. Sadly, that wasn’t always the case, and I’m sure many of us remember the extra sheet – sometimes sheets! – that Peter would include with copies of his papers he sent to people listing all the errors that remained in the text because they hadn’t been corrected by – as requested of! – the publisher. But, there’s nothing wrong with attention to detail. After all, from a science perspective, that’s often where the interesting discoveries lie. Peter seemed to know everybody who was worth knowing in the plant biology world. He had many contacts and acquaintances – around the world – and at one time or another collaborated with most of them on various projects and publications. Several of these plant biology notables visited the Long Ashton lab during my time there, and Peter was always keen to involve me in meeting-and-greeting these worthies from the world of plant science. From my time in Sweden – a year’s foreign sojourn at the Swedish University of Agricultural Sciences (SLU) in Umeå between my two 3-year spells working with Peter – one phrase sticks in my mind. When my Swedish colleagues would mention somebody whom I’d not heard of, they would say “Oh yes, he’s world famous – in Sweden”. Well, Peter it seems was world famous in Sweden, and just about everywhere else where plant biology was studied. Peter kept in touch with me when I left Long Ashton, and would often send me items he thought might be useful for my Plant Cuttings collections. My favourite is a paper entitled “Trees, Tusks, and Roots Relating to Human Health and Teeth” by Louis Touyz (2015), a South African-born dentist. The purpose of that article was many-fold: To discuss trees and their relationship to human health; to appraise tree and other roots in relation to oral health and human teeth; and to discuss the elephant and the beaver that use their teeth to eat trees to survive. When I asked Peter how he’d come across such an unusual item, he explained that he was clearing out his eMail spam folder, saw it and ‘thought of me’… I guess I should be suitably flattered?! Anyway, I did manage to weave it into one of my own items, which therefore extended our collaboration well into 2016. Peter was a remarkably cool dude. This may sound surprising. On first acquaintance Peter struck one as a perfect English gentleman who was very polite, rather reserved and quite formal, ‘old school’ if you will. But once you’d got to know him better – and he you – he was great company and good fun. But, cool? Bear with me. I remember well the first part of the registration of Peter’s Volkswagen car whilst we were at Long Ashton. It was PPB. Now, since Peter’s initials were PWB, this isn’t some rather vulgar personalised number plate. Rather, what I think is this – and it’s much more subtle. PPB is the initialism for Pre-Prophase Band [Mineyuki, 1999], a structure that develops in plant cells and is associated with cell division, a topic Peter researched for many years. Thus, the vehicles’ registration was actually a cryptic insight into his professional work. Now, that is cool, and a great example of Peter’s wit. And is more than a little reminiscent of American Nobel Prize-winning, bongo-playing, physicist Richard Feynman, who provided a graphically enigmatic clue to his own research interests by decorating his van with his iconic Feynman diagrams. Peter was a true polymath. It’s really only in the last few weeks as I’ve talked to others about Peter’s life that I’ve discovered a whole range of other skills and talents that Peter had. He had published two books of his own English translations of Spanish writings, “Duotto” by the Chilean poet Gonzalo Rojas and the surrealist Chilean painter Matta, and “Draft of Shadows” by the Mexican poet Octavio Paz. Peter was working on a third translation at the time of his passing, “Endless Death” by José Gorostiza, another Mexican poet. Peter was an accomplished pianist and would tackle such items as Scriabin sonatas (which I’m told are sufficiently challenging to make most amateur musicians quail), and was a singer with a melodious bass voice used to very good effect in the Somerset Singers choir. Peter also tackled various art-forms including creating images of the South American Altiplano as viewed from an aeroplane, and various collages. He was also something of an aficionado of the work of John Cowper Powys, and possessed an enviable, fine and exhaustive collection of his works. Peter was an extremely accomplished cook – his zaalouk was an amazing taste sensation. Finally, and ever the botanist, Peter loved his garden at his home in Somerset and took great pleasure in ‘showing it off’ to visitors. Demonstrably, Peter Barlow was not only an exceptional plant scientist, but also an exceptional and multi-facetted human being. And one for whom the phrase Renaissance man is apt. I’m sure there will be more praise and assessment of Peter’s considerable contributions to science in the months to come. For now, I thank you for allowing me to share some rather more personal memories of this remarkable scholar. Touyz LZG (2015) Trees, Tusks, and Roots Relating to Human Health and Teeth. Jacobs Journal of Physiology. 2015, 1(2): 008.